Make delightfully amusing treats with our playful Cuisipro® Ice Cream Scoop & Stack. The scoop & stack creates cylindrical blocks of ice cream that can be decorated or stacked for a colorful and creative presentation. The ergonomic scooper cuts through the hardest ice cream with a simple twist-and-lift action. Push button release. Each scoop holds 3.75oz ice cream., is dishwasher safe on top rack, and is available in various colors. In our house, ice cream is a treat that's served year round! Since it's been so warm this Summer, the kid's enjoy it a little more frequently than normal. I love to find toppings and other little ways to make it a fun treat for them. The Cuisipro Scoop & Stack is so neat! 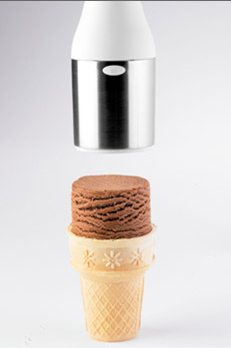 Unique in it's design, the "Scoop" comes out in a perfect cylinder on a cone or in a dish, and is great for ice cream sandwich making ! It's simple to use, and a fun new way to serve up ice cream to my family and guests! What a great way to serve up cool treats this summer! One Lucky Reader receive a Cuisipro Ice Cream Scoop & Stack! 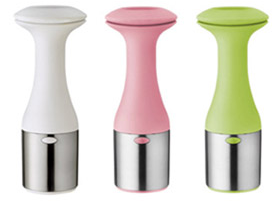 Leave a comment ~ Which innovative Cuisipro Kitchen tool would you love to add to your kitchen? The comment is considered your entry. Believe it or not, that ice cream scoop and stack would be a great addition. We eat ice cream so much that it would definitely come in handy. We have broken so many ice cream scoops because of hard and frozen ice cream. This looks so awesome and innovative! I love this ice cream scoop! I would love it to make cool looking ice cream for parties! I enter all of your other contests! The Zoo Animal Cookie Cutter Set looks cool. I love ice cream so this would be a great prize, thanks for hosting! Following your RSS feed via Bloglines. I'd also love to have the Donvier Ice Cream Maker! I would love to add the Cupcake corer and decorating set to my kitchen. in a dream world, i would have one of each..
i would like the pasta insert though! That Stay Cool Rolling Pin would be a lifesaver at my house!